Rotisserie Pork Loin; Move Over Chicken! Roasting a pork loin on a rotisserie is incredibly easy and delicious. I am amazed that chicken gets all the rotisserie attention while the pork loin is left laying there neglected. 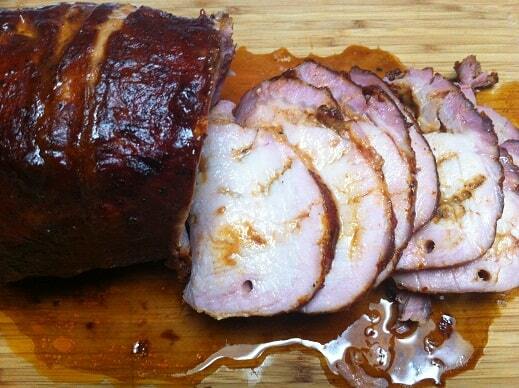 Hopefully this post will convince you to give rotisserie pork loin the chance it deserves! 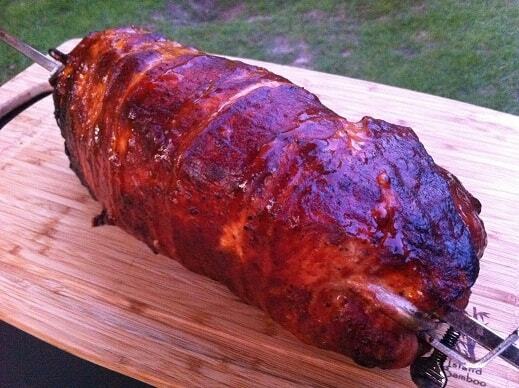 You can approach a rotisserie pork loin almost any way you want and it will turn out great. The one pitfall is making sure the loin does not dry out. There are three approaches to keeping the pork moist and they all work great; you can even use all three in combination and get pork that is literally squirting moisture when sliced. Do not cook the pork loin past 150F. Sometimes I am not paying attention, it gets up around 160F and still turns out fine. Do not even think about taking a pork loin to 170F. Start with an “enhanced” pork loin. Much of the pork in stores that looks like a plain old piece of pork has already been pumped with an extra 12 wt% of a saline/phosphate solution. 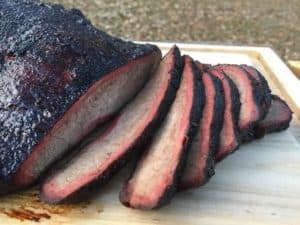 There are obvious cons to using such a processed piece of meat but one thing you can’t deny is that it keeps the loin juicy. Inject the loin with a marinade. Don’t bother soaking the pork loin in a marinade; they stuff just doesn’t penetrate. If you take your time you can easily inject 10 ounces of marinade into a 5 pound loin. Let the loin rest for a few hours after injection if possible to let the marinade distribute a little. In this first cook I scored the fat cap on a 5 pound pork loin, rubbed it with a sweet rub (McCormick’s Maple Smokehouse) and cooked it on the Weber kettle rotisserie. If you want to experiment with different seasonings then any of the classic rib rubs work great on pork loin. I had both charcoal baskets lit (one on each side of the rotisserie) and was roasting the pork with High Heat. The cook took 90 minutes and towards the end I glazed the loin with melted peach preserves. It looked awesome and tasted delicious. Pork handles a sweet flavor profile very well and peaches make a great addition. 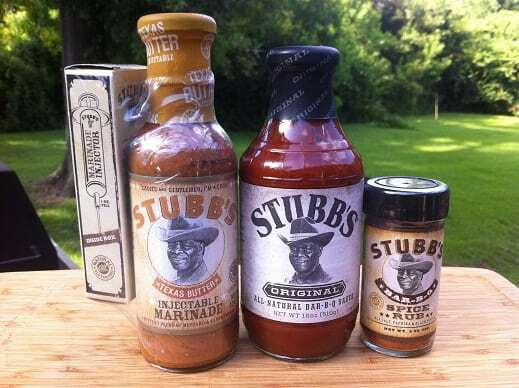 In the second cook I went with a more savory flavor profile while trying out the Stubb’s product line. I injected the loin with the Stubb’s Texas Butter (delicious! ), left the fat cap intact, and rubbed the pork with some Stubb’s seasoning (paprika, salt, pepper). I cooked the loin on my Weber Genesis rotisserie with the back two burners off and the front burner on High. Unlike the cook I did on the kettle I was cooking this loin with Low Heat. After two hours I brushed the loin with Stubb’s Original barbeque sauce (tomato, vinegar, and molasses) and turned the back burner to High to help the sauce set. After another 30 minutes the loin was perfect. You don’t really need to truss a pork loin but it doesn’t hurt either. You will want to use a drip pan and it’s a good idea to add some water to the pan to keep drippings from scorching. Use of smoke wood is a nice addition as well. These were incredibly easy to cook and were big hits with the family. 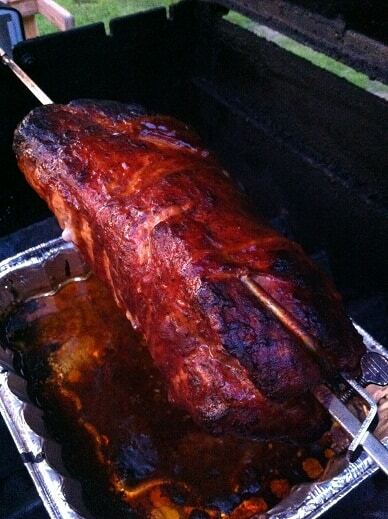 Sweet or savory, charcoal or gas; any way you turn it, pork loin is awesome on a rotisserie! Here are two little videos I shot of each cook using the two different Weber rotisseries. I love watching these things spin! I did not notice an appreciable difference between the loin cooked with High and Low heat. I think that as long as the loin is prepped properly and not cooked past 150F it will come out great regardless of cooking temperature.